Give eggplant parm a twist—literally—by rolling the ricotta mixture inside each pre-baked eggplant slice before topping with marinara and mozzarella. Heat oven to 450° F. Divide the oil between 2 rimmed baking sheets. Dividing evenly, arrange the eggplant slices in a single layer on the baking sheets and turn to coat in the oil; season with ½ teaspoon salt and ¼ teaspoon pepper. Bake the eggplant, rotating the baking sheets halfway through, until soft and beginning to brown, 12 to 15 minutes; let cool. Reduce heat to 400° F.
Meanwhile, in the bottom of a 9-by-13-inch or some other 3-quart baking dish, spread ½ cup of the marinara sauce. In a large bowl, whisk together the eggs, ricotta, oregano, 1 cup of the mozzarella, and ¼ teaspoon each salt and pepper. Place about 3 tablespoons of the ricotta mixture on one end of a slice of eggplant, roll it up, and transfer it to the prepared baking dish. Repeat with the remaining eggplant slices and ricotta mixture. 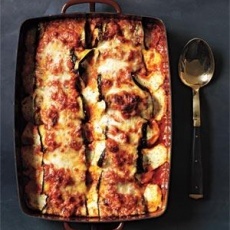 Top the eggplant rolls with the remaining cup of marinara sauce and the remaining cup of mozzarella. Sprinkle with the Parmesan. Bake until the cheese has melted and the sauce is bubbling, 20 to 25 minutes. Let cool for 5 minutes before serving.